Enriched with soothing shea nut butter, vitamin E, gentle sulphate free foaming cleansers and fine ground walnut shells used as a gentle exfoliant. A natural scrub for softer, smoother skin. 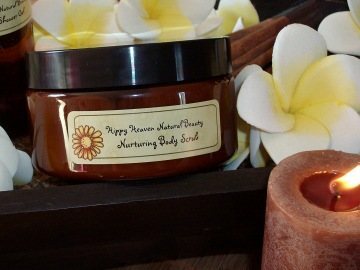 Create your own skincare using Hippy Heaven's Body Scrub formulation. The scrub removes dirt and impurities that can dull the appearance of skin and promotes healthy looking skin. The skin is left moisturised and softened. Scrub remains fresh to use one year from purchase. Packaged in an eco-friendly PET jar with caska seal and lid. Preservatives: Adding essential oils to your base product will not affect the life span of your creation. In fact, some essential oils act as an additional preservative! Should you choose to add other raw ingredients (such as extracts or exfoliants) to your base, your products will generally last at least six months from when they are combined. Additional preservation is not necessary for personal use, but should you choose to sell your products, preservatives such as rosemary leaf extract, tea tree or vanilla essential oil, vitamin E, or your choice of synthetic preservative will help lengthen the life of your products giving your customers longer to enjoy them! Heaven Signature Blend - A luscious blend of cedarwood atlas, sweet marjoram, geranium, frankincense, lime, lavender, sandalwood and more, creating a woody, light scent with mild earthy, citrus and floral undertones. Perfect for everyday, a clear mind and relaxation. Hippy - Perfect for warm summer days, with a refreshing citrus aroma, combining patchouli and sweet Australian orange oil. A subtle blend, wonderful to layer several products on your skin for an all day, long lasting, natural scent. Energy - With rosewood, peppermint, lemon myrtle, lime and more. An invigorating scent with citrus and wood undertones. An excellent choice for men, or to revive and refresh. Intimacy - Ylang ylang, patchouli, cedarwood atlas and lemon combine to create a beautiful earthy scent wonderful for intimacy. Perfect for togetherness and harmony. Peace - A soothing combination of Mandarin and Lavender. Designed to relax and unwind the senses. Sugar n Spice - A sweet spicy blend of vanilla and cinnamon, perfect for those with a sweet tooth! Spring Revival - Sweet orange and vanilla combine to evoke a "spring is in the air" mood. Wonderful for use any time of year!